I love travelling to hot and very passionate places, and southern Italy’s expressive culture is hot and passionate – sometimes hotter than the Costiera Amalfitana’s subtropical sun. 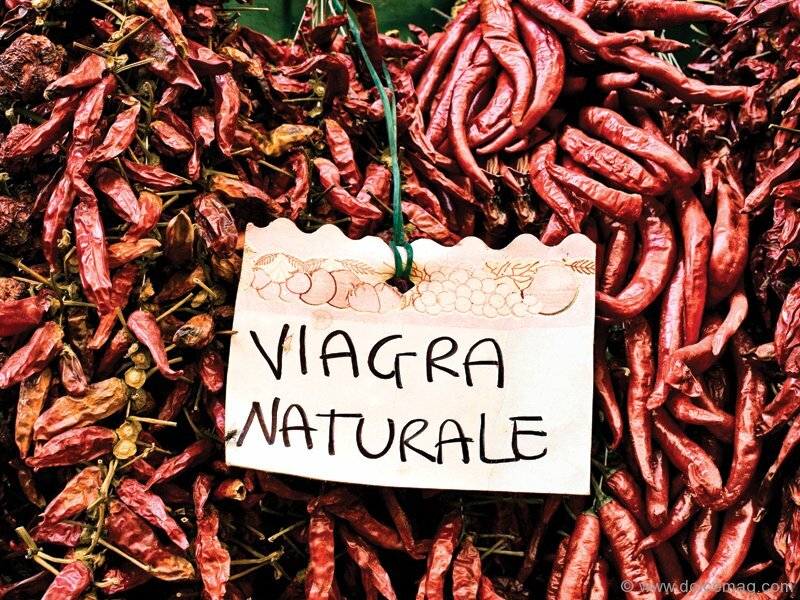 The Amalfi Coast is ideal for a solar café lifestyle, sun drying tomatoes or buying red hot chilli peppers advertised on a shop sign as “Viagra Naturale” – a storekeeper’s tongue-in-cheek statement promising wholesome foods for a healthy lifestyle. This alluring passion and open-hearted culture is the Costiera Amalfitana way of life. 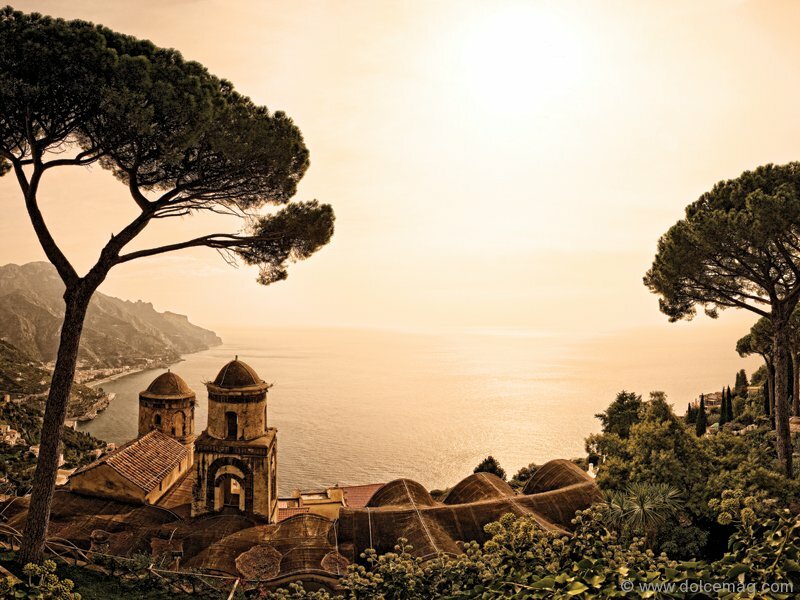 The Amalfi Coast is a UNESCO World Heritage Site about 225 kilometres south of Rome. 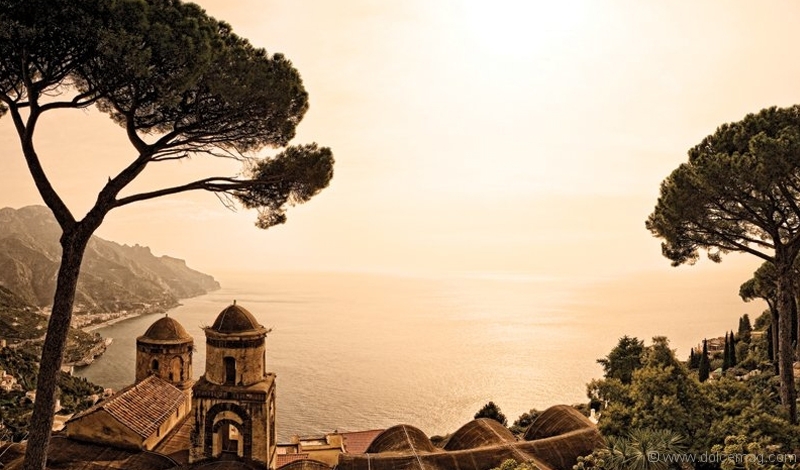 Here, the amazing Amalfi Coast Drive was originally built by Romans and is a long-standing declaration to their engineering and road-building conquests. The Amalfi Coast Drive is a journey between Rome and paradise, carved into rugged cliffs plunging dramatically into the Tyrrhenian Sea. It’s one of the most spectacular drives in the world, with gorgeous combinations of natural beauty, coastal seascapes and old-world villages perched on steep cliffs like Roman eagles scouting the Mediterranean for Saracen invaders. I see weathered fishermen paddling rowboats surrounded by the expansive Tyrrhenian Sea, bringing fish to local restaurants where nobody’s in a rush. There’s no need for reservation of any type and the attitude is “chi va piano, va sano e va lontano,” meaning, “who goes slow, goes healthy and goes far.” Life goes slowly and surely here. That’s why lunch in southern Italy is about three hours long and the only “golden arches” are the ones on well-tanned feet sporting Positanese sandals. 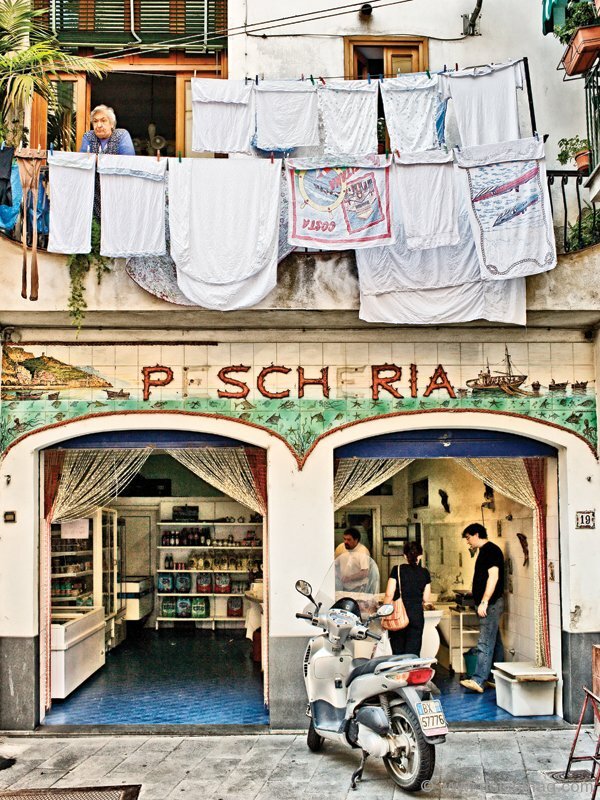 On the Costiera Amalfitana, you find fresh Mediterranean cuisine cooked just like grandma’s. 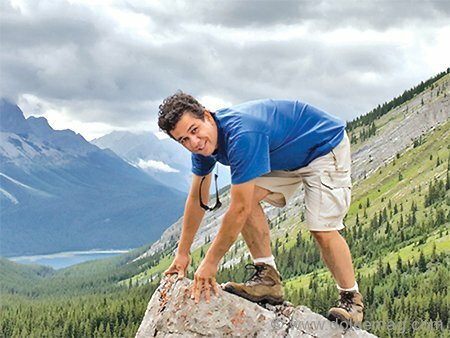 The Amalfitani people honour their cultural foundation and the past is not paved over – they cherish it as they cherish their honoured elders. I see a happier and healthier life in this village environment, where café life, rather than coffee breaks, is a lifestyle and going to the laundromat means opening a window and hanging laundry out to dry in the sun. 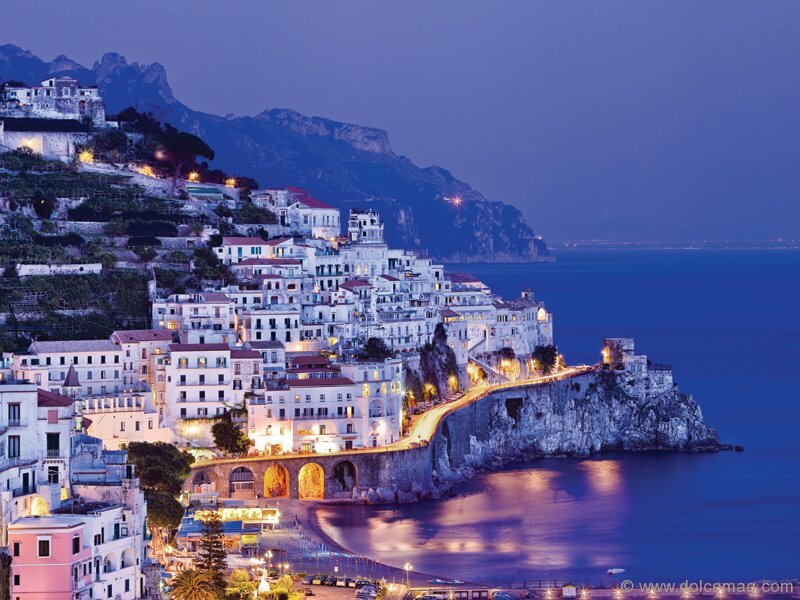 On the Amalfi Coast, traditional maritime life joins with contemporary European living. 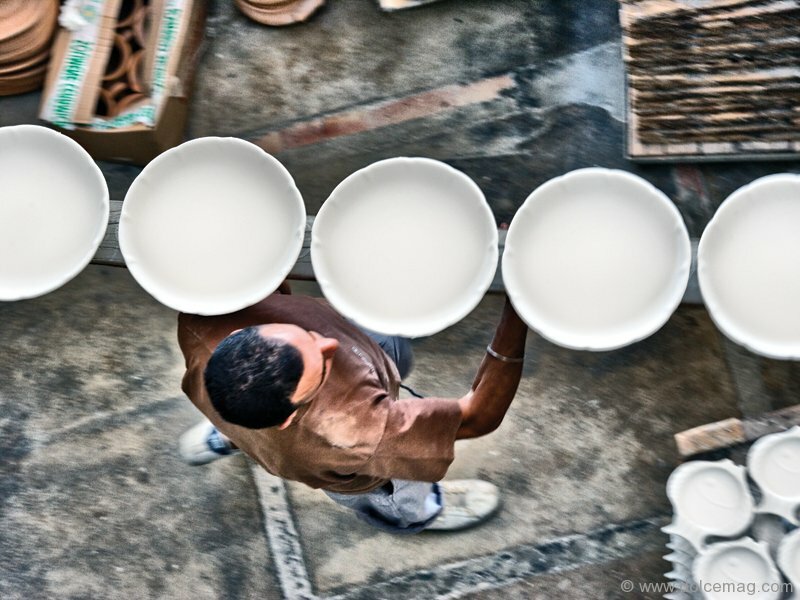 The elders and the young are together: plumbers are artists, and fishermen are philosophers. The Amalfi Coastal communities coexist to evolve a healthy village lifestyle with people of all ages taking the journey of life together. There’s ease – people know their neighbours, and instead of shopping at supermarkets, they go to family stores selling specialities of fresh fish, cheese, pasta, ceramics. Warm personal service at these traditional stores is characteristic of the Costiera Amalfitana village lifestyle. At night, I walk in narrow tunnels curving under cliffhanging buildings stacked like pancakes, while unseen villagers cast shadows on wizened walls. 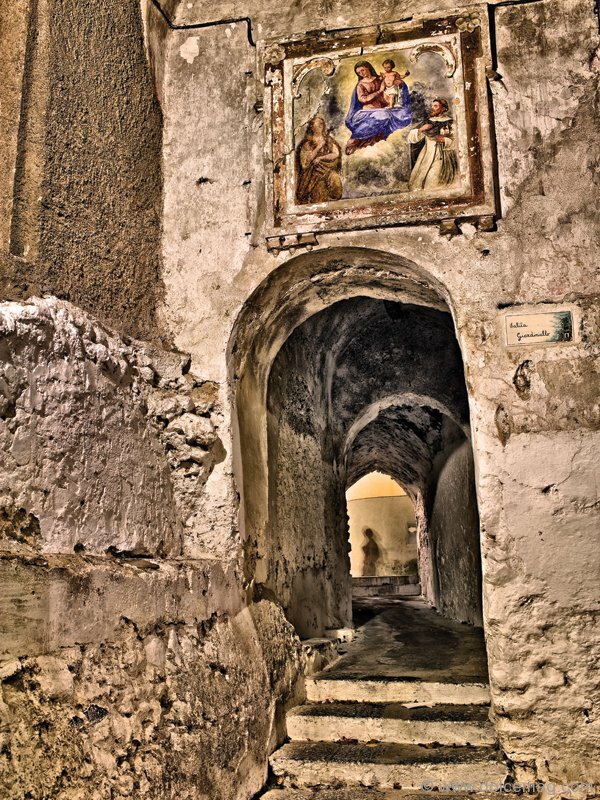 Religious paintings and altars in these passageways hold at bay ancient spirits on an extended Roman holiday. It’s easy to imagine it being in movies because in the 1960s, the Costiera Amalfitana was a famous destination for Rome’s La Dolce Vita film scene. After all, this is the “Costa Diva – Le Vie del Cinema” (Diva Coast – The Way of Cinema), where films such as L’Amore: Il Miracolo starring Anna Magnani and directed by Roberto Rossellini were shot. 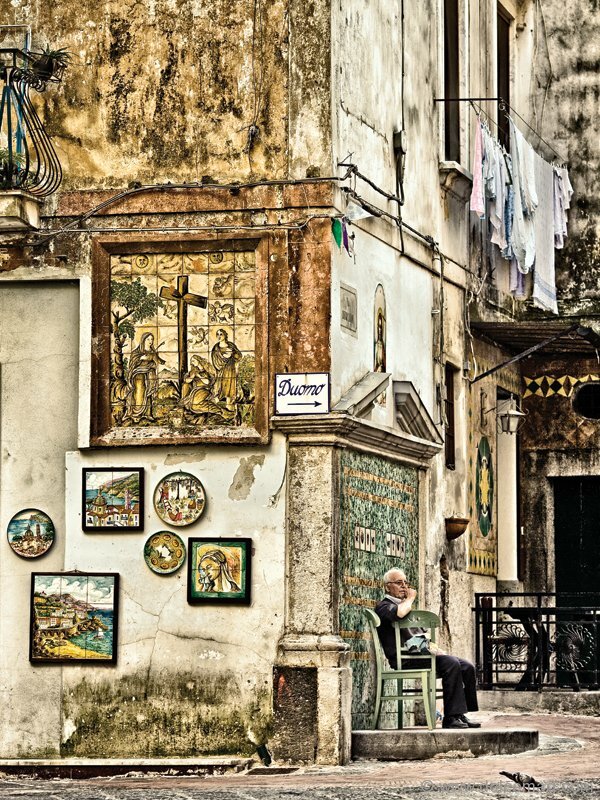 Coming out of the covered passageway, I enter Amalfi’s Piazza del Duomo and conversations resound in the intimate piazza, which buzzes with well-dressed Italians in their bella figura. The women’s olive skin is sweetly embraced by flowing hair and natural Mediterranean beauty. 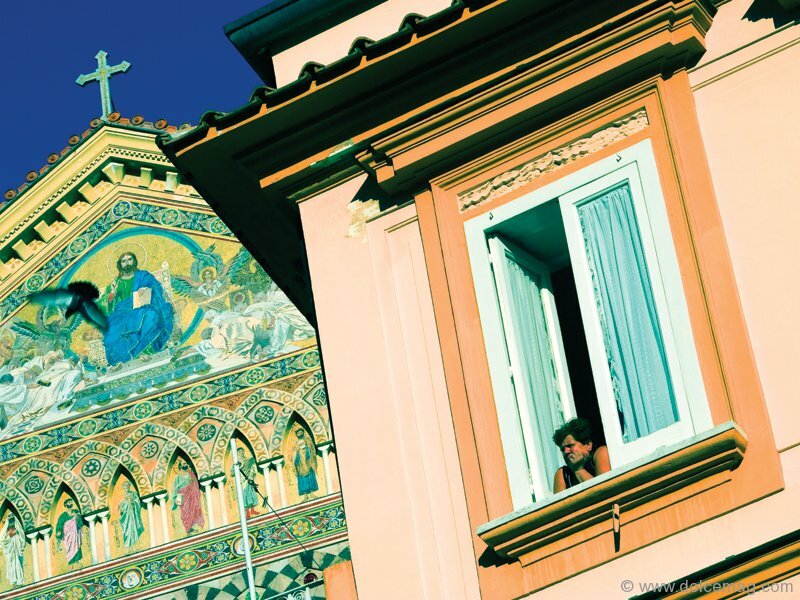 The Dolce Vita, or sweet life, is the essence of daily life here, where beauty and passion rule at all levels in art, architecture, cuisine, people, lifestyle and fashion. A stylish young Italian couple on a vintage Vespa lean into curves on the Amalfi Coast Drive at night – perhaps to dine in the village of Positano. Along with Positano’s beautiful beach, this commune is known for its fashion. In the ’50s and early ’60s, the Positanesi began making Moda Positano (Positano Fashion), clothing made with colourful and interesting patterned cloth, linen and macramé. The antique Amalfi Coast doesn’t mean Amalfitani style is aged– it finds balance with New World elegance. Like the young couple in the breeze who are full of unconstrained freedom and passion for each other while riding their vintage Vespa that, like a wasp – the classic motorbike it’s named after – still has lots of great zip and sting. It’s blazing in the Amalfi Coast and it’s time for a limoncello at La Sponda in Hotel Le Sirenuse – named after an archipelago of islands off Positano’s coast, where tales say mythological sirens with sultry voices and mesmerizing music allured ships onto the rocks. I hope to see some of those mythical sirens while sipping my lemon liqueur. Not on the rocks, please: this is la dolce vita.